Foot-and-mouth disease virus (FMDV) exhibits high mutation rates during replication. In this study, an isolate of FMDV serotype Asia-1 was serially passaged in a BHK-21 cell monolayer and then adapted to serum-free BHK-21 cell suspension culture to produce a seed virus for production of an inactivated vaccine. Analysis of the sequence encoding the structural proteins of the virus at various passages showed the presence of overlapping peaks in sequencing electropherograms after nucleotide 619 of VP1 in viruses recovered from the fourth passage in suspension culture, suggesting the possible introduction of an insertion or deletion into this portion of the viral genome of our seed virus stock. 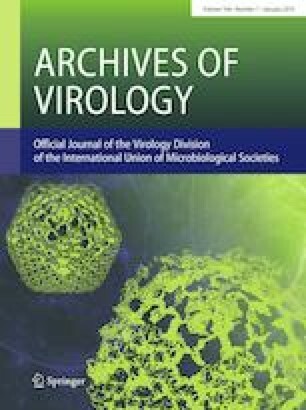 To evaluate this phenomenon, a virus designated “Vac-Asia1-VDLV”, was isolated by plaque purification from the tenth passage in suspension culture. Sequencing results showed that a 12-nt-long exogenous sequence was inserted into the 3’ end of the VP1 coding region at the position where the original overlapping peaks were identified. Analysis of the host cell transcriptome showed that the 12-nt sequence was identical to a highly expressed sequence in BHK-21 cells, strongly suggesting that recombination between the FMDV genome and host cell mRNA produced the recombinant virus. A growth curve showed that the virus with the 12-nt insertion reached a peak earlier than the parental strain and that this virus had acquired the ability to bind to the cell surface by a mechanism that was not dependent on integrin or the heparan sulfate receptor. This novel pathogen-host cell recombination event is discussed in terms of the mechanism of viral RNA replication and the phenotypic constraints of FMDV biology and evolution. The online version of this article ( https://doi.org/10.1007/s00705-018-4008-2) contains supplementary material, which is available to authorized users. We sincerely thank all the technical staffs of Tecon Co., LTD and China Animal Husbandry Industry Co., LTD for their help in these studies. We thank Yingju Xia of the Department of Reference Material at China Institute of Veterinary Drug Control for critical reading of the manuscript. This study was funded by National Key Research and Development Program of China (No. 2016YFD0501500) and the Special Fund for Agro-Scientific Research in the Public Interest (201303046).